Answers to questions about the basics of pressure measurement, including why measuring gauge pressure is fine for most applications but absolute pressure measurement is required in some cases. Pressure is generally defined as a force that acts uniformly over a specified area. When you press the button on a doorbell, for example, the pressure of your fingertip applies a physical force that triggers an electric actuation switch inside the doorbell, which then sends a signal to chime. In industrial applications, the force that is applied over an area is usually a gas or liquid, but it can also be a solid. Why do we measure pressure? Monitoring pressure is an essential part of modern society. Across the globe, countless pressure sensors and gauges are constantly providing pressure readings in refineries, manufacturing facilities, homes, and vehicles. This is done to ensure that the pressure is within acceptable bounds and, if not, to alert operators to rectify the situation. What is absolute pressure, and how does that compare to gauge pressure? Atmospheric pressure. Everything around us – the air and water – has weight and creates pressure. At sea level, the average pressure is 1 atm, or 1.01325 bar; the pressure varies according to weather conditions. As the elevation increases, the air gets thinner and so does the atmospheric pressure. Gauge pressure. The zero in gauge pressure is the atmospheric pressure, which means a gauge pressure reading includes just the additional pressure within a system. Absolute pressure. The zero in absolute pressure is a perfect vacuum, which means an absolute pressure reading includes both the atmospheric pressure and the gauge pressure. An important distinction between the latter two types of pressure is the zero reference. The zero in instruments that measure gauge pressure is ambient air, which varies according to elevation and weather conditions. The zero in instruments that measure absolute pressure is the total absence of pressure, or a vacuum; therefore, this zero does not vary. 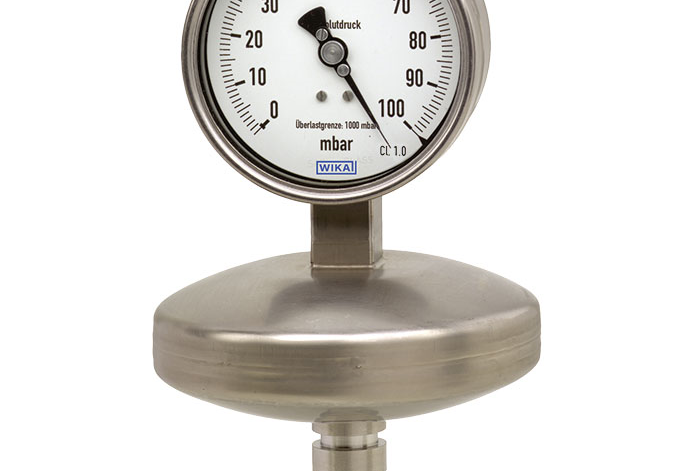 What are the advantages of measuring absolute pressure vs. gauge pressure? Since all of the facilities and processes in a refinery or manufacturing plant share the same elevation and atmospheric pressure, measuring the gauge pressure is accurate enough for most situations. However, absolute pressure measurements are called for in specialized situations, such as when you need pressure measurement independent of fluctuations in atmospheric pressure, and in industrial plants where vacuum pumps and vacuum packing machinery are used. Absolute pressure gauges and transmitters are found in numerous applications, including altimeters for aviation, monitors for liquid vapor pressure, distillation processes, HVAC, and semiconductor manufacturing. The pressure of dangerous arsine and phosphine gases used in the semiconductor manufacturing process must be carefully monitored during storage and transport. Because atmospheric conditions fluctuate, it’s important when monitoring dangerous gases to use a reference point that does not change. How do absolute pressure gauges work? Absolute pressure gauges include an internal vacuum chamber that is used as a reference for making pressure measurements. Diaphragm-based absolute pressure gauges have a firm yet flexible panel that separates a media chamber and a vacuum chamber. The local ambient pressure in the media chamber causes the diaphragm to deform into the vacuum chamber. The amount of deformation is converted into a pressure value. This value is then indicated on the gauge dial. Learn more about pressure and the various applications for pressure measurement from these free WIKA resources.